Financial matters are mentioned in the Bible more often than prayer, healing, or mercy. With so many people living paycheck to paycheck, struggling to build their credit and worried they will be in debt the rest of their lives, we need the Bible’s words of financial wisdom more than ever. 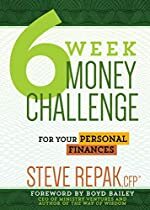 Certified Financial PlannerTM Steve Repak reveals what the Bible has to say about spending, saving, and giving in this 6-Week Money Challenge. His simple, step-by-step program is founded on biblical principles paired with a CFPTM’s understanding of modern wealth-management strategies. Steve inspires and motivates readers to change their financial lives by challenging them to commit to his biblical boot camp. In just six weeks, readers will complete practical and achievable weekly challenges designed for group or individual use. Take the 6-week money challenge now and get fit for a healthy financial future. This entry was posted in Money on October 23, 2016 by admin.